Bridgewater’s One Book One Community Committee will sponsor a Kickoff event at the Bridgewater Public Library on Saturday, March 15th. 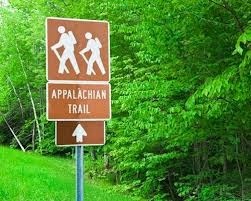 “Take a Hike: Tales of Life on the Appalachian Trail” will take place from 11a.m. to 1p.m. in the library’s Flora T. Little Room on the lower level. This will be a panel discussion led by through hikers from the Appalachian Trail. Gorp (a.k.a. trail mix) will be served. The One Book One Community committee has chosen two selections this spring. One is Bill Bryson’s A Walk in the Woods and the companion title is Jennifer Pharr Davis’ Becoming Odyssa. Both books are memoirs written by people who have hiked the Appalachian Trail. There will be jobs for all skill levels! We hope the community of high school students, college students, parents, grandparents, businesses, service clubs etc. will come together to make this playground a reality. Just think of the friendships and community pride that will be created as we all work together on this worthwhile project. It will be fun telling your children, grandchildren, nieces and nephews how you helped put the playground together!